The Caframo Ecofan Original 800CAXBX Heat Powered Stove Fan is a must have if you live in a region with harsh winters or experience regular power outages in the cold. 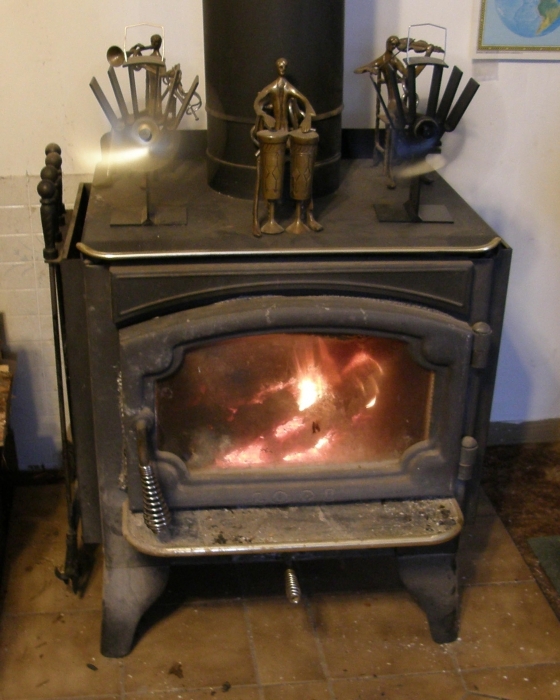 Having a wood stove in your home is imperative to keeping warm but, as everyone knows, heat rises. That's where the Ecofan comes in. Caframo Ecofans run solely on the heat produced from your stove. That means they work even with power outages! Not to mention they help solve the issue of too much heat rising into the room. This fan creates its own electricity and pushes warm air up to 100CFM (cubic feet per minute). It works best on stoves with a surface temperature between 230 and 650 degrees Fahrenheit. Generating no additional noise during operation and coming completely assembled are two features that also make this fan a great gift. 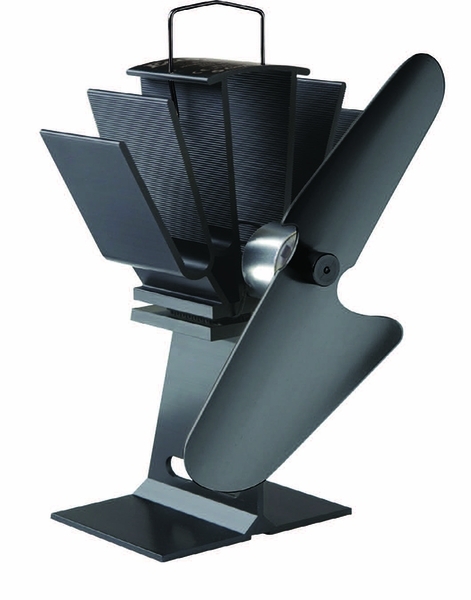 With this cordless, highly energy efficient fan, you will enjoy the power of a blower whenever your stove is hot. Will this product work on a gas fired stove? 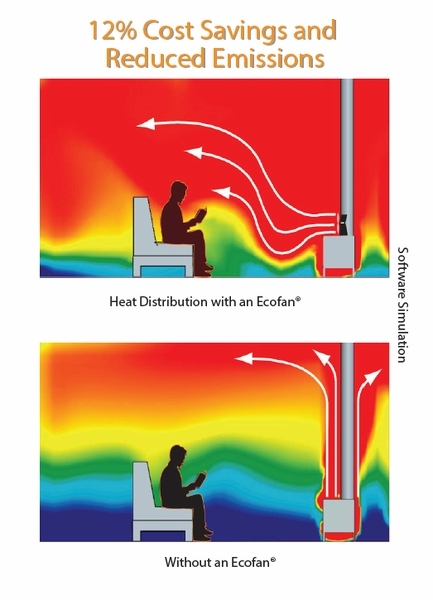 While you could check the surface temperatures of your stove to ensure the required range for this fan of 230 - 650 degrees is continuously maintained, the Caframo Ecofan CA 806 Heat Powered Fan for Gas and Pellet Stoves is made specifically for freestanding gas stoves and may be a much better option. Will an Empire propane vent less stove that I purchased from eFireplace last year have high enough surface temperature to operate this product? While this version will not work, the Caframo Ecofan CA 806 Heat Powered Fan for Gas & Pellet Stoves will operate properly with the stove. Will these Caframo Ecofan original 800CAXBX heat powered stove fans work if placed on top of a cast iron steam radiator? They would indeed operate if the radiator has a flat and level surface reaching temperatures of at least 230 degree F. I would first recommend using an infrared thermometer to confirm the surface temperature to further confirm. Yes. The speed of the fan is dependent upon the temperature of the surface upon which the unit is positioned. To obtain the maximum speed the surface temperature should be about 300 - 400 degrees (such as a wood stove) but it will operate on lower temperatures. The lower the temperature, the slower the fan. How is this Caframo Ecofan original 800CAXBX heat powered stove fan mounted? 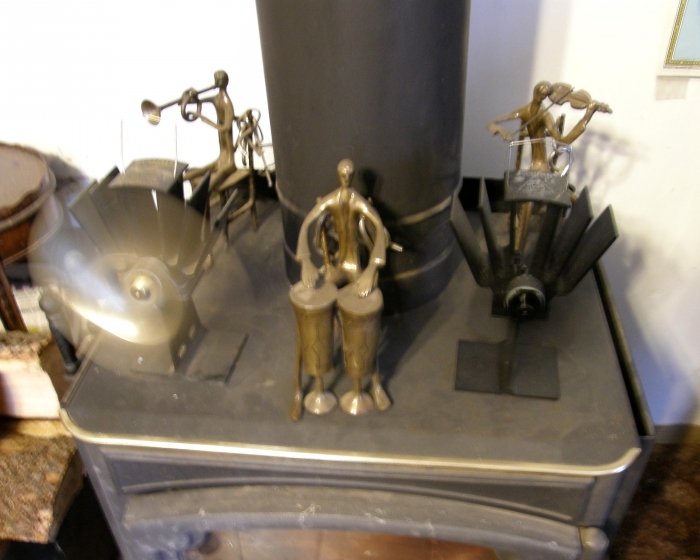 These are simply set on the top of a wood burning stove. There is no hardware or attachment needed in order for this Ecofan to operate. 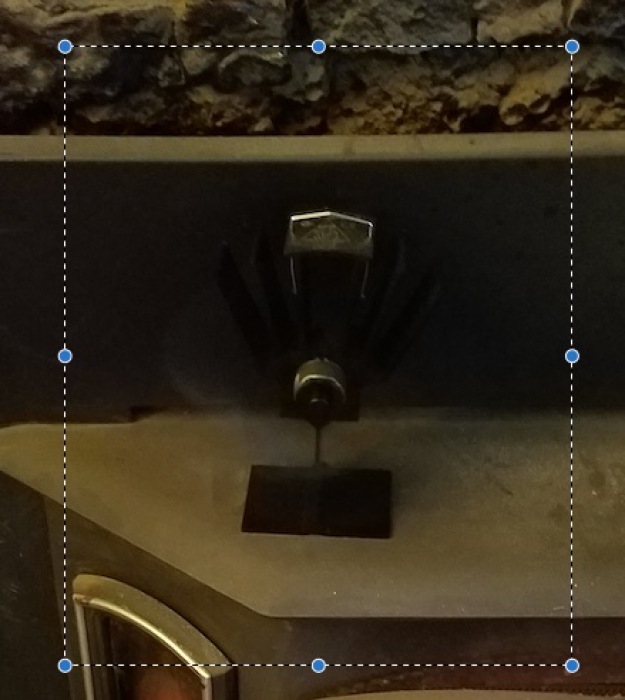 What is the width of the actual base of this Caframo Ecofan original 800CAXBX heat powered stove fan? The base on this model measures 4 inches wide and 3 inches deep. Will this fan work well on a wood burning fireplace insert? If the surface temperature of your insert reaches 230 degrees, the fan would work, however, there may not be much room for air flow due to the lack of space on this surface. I would use an infrared thermometer to check the surface temperature first. Would this fan work on top of a small gas fireplace? I would first take a temperature reading from the top of the appliance where the fan would be set. If the surface reaches at least 230�F, this fan would indeed operate. What are the dimensions of the base plate of this Caframo fan? Also, is there anything protruding from the back of it? How much space is recommended from the back wall surface to the back of the fan? The base of this fan is 4" x 3". There is nothing protruding from the rear of the fan. It is advised that the fan be used towards the rear of the stove, about 6"-12" from the back wall depending on the size of the stove. How is this fan installed? Are there pictures that show the fan after it is installed? The fan is set atop a wood burning stove closer to the rear of the stove top in order to operate most efficiently. If you view the photos shown on our more popular Caframo Ecofan UltraAir 810 we have attached customer submitted photos showing the placement and operation of their fans. There is no need to install the fan. You simply set it on any flat surface of your woods stove and it begins to circulate the heat once it warms up. This fan is a little wonder. Whirring away, consuming no electricity and efficiently distributing heat in the room. I'm going to get the tea light-LED lamp because I am charmed by the elegant conversion of heat to electricity. can't believe how great it works! We have had this for two seasons. It keeps our old farmhouse warmer. Along with adding more firebricks, the wood stove burns wood more efficiently. I wish we had purchased the bigger version. Proswood stove burns wood more efficiently. We have had two of these fans for over 20 years and they have never failed. We use one on our wood heater and one on our Empire direct vent wall heater and they work wonderfully. I was amazed how this fan works. We have a rather large family room where the wood stove is, and the stove has its own fan built in, so we are using this as an extra boost to help move the heat a little more. This fan would probably be a real nice boost for a wood stove in a smaller room. It does do okay in our large room as far as helping to circulate the heat a bit more. I would certainly recommend this fan! This doesn't go on until the stove reaches a very high setting They do sell one that will start turning at a more reasonable temperature, say 100 to 130. It costs almost twice as much, but if you want a fan to run buy the more expensive one. Mine is in a box in my shed because it only turns on when the house is 85 degrees. ConsWon't turn on very often with a pellet stove. Probably very good with a wood stove. I was surprised what a difference this little fan made in our bedroom. It pushed just enough hot air from the wood stove to make it quite comfortable in there. Im thinking we need to purchase additional fans for our other 2 stoves. I never owned one of these before and just had hearsay from other people, I was quite pleased with the fan and its durability. besides the price was excellent and the fan was at my home before I was. Prosmost excellent for a starter fan . I would get two. Incredibly fast service and the products look well-made! Thank you! This fan is very nice for a small room. This is the smallest of them all. It's some what intrusive as it stands tall on the stove. It moves the air around and creates a form of turbulence. The fan turns really fast and makes a little noice but not intrusive. Wislity is nice and well built. ProsWell built and it does what it made for. Fun to see when you come home that the stove is still 'on' because the fan is spinning. Good indicator of how hot the stove is. ConsAlways a moving object in your eye sight. Our finished basement where we have our wood stove used to be hot near the stove and cold the farther you moved away from it. That is normal right? Now with this Ecofan, the warm air circulates around and keeps an even temperature a!most all around the area. Should have bought this a long term ago! Prosif it wears out, just buy replacement parts...and so far I have never had to fix one. Looks gr8 and works gr8. Since is not electric and simply works off heat from stove to have blades move am concerned that i was asked if I wanted to purchase any additional motors? I will not be happy I was i have to. I was delighted to receive the Ecofan and put it right to work upon opening the package. It began spinning and moving heat. After two weeks, it would spin if I spun it to get it going. Now, it doesn't spin/work regardless. I haven't moved it, never mind dropped it or some other thing that might cause it to stop working. Maybe the motor needs to be replaced already? ConsStopped working after two weeks. While it was a bit smaller than I expected it is very effective at improving heat circulation throughout the house. I'm very satisfied with the fan and the service provided by efireplacestore.com. I love this fan, it works so well, it's quite, best of it doesn't need electricity. I love it, and plan on purchasing another one. ProsWorks off the hot air from stove. I was impressed with this little fan. It doesn't move much air that you can feel but it does make the room much warmer. Makes the whole room warm. Prosno electricity required and it turned on very quickly. And I've already recommended to my friends. Very cool fan, runs off the heat does a great job and blows little kids minds. I love this fan...it works as advertised. I first saw this fan on a friends boat. He had it on his stove and it worked off the heat. I bought one and recently bought another one at a lower price. They both work great and the new one with the black blade is more efficient. ProsMove air around. It doesn't seem like much until you put you blow something in front and see just how far it moves it. excellent service & fan does exactly what it's supposed to-liking it enough that I'll probably upgrade to the next size up ! This is the second one that I own and feel that it performs as stated. I plan to purchase more in the future. ProsFunctions as stated and even keeps on working while my reclaimer stops a s the stove temperature goes down. We had a power outtage a while back. With the Ecofan on top of out stove we stayed nice and warm! It doesn't take long to start spinning... you don't feel a breeze, but it moves the heat. Works well to balance the heat from the kitchen to the rest of the house, Awesome!! I have used this product before. I just got the chance to order two more! I know they work great! My first one was fantastic!! circulates air into room. Help keep the whole area warm. 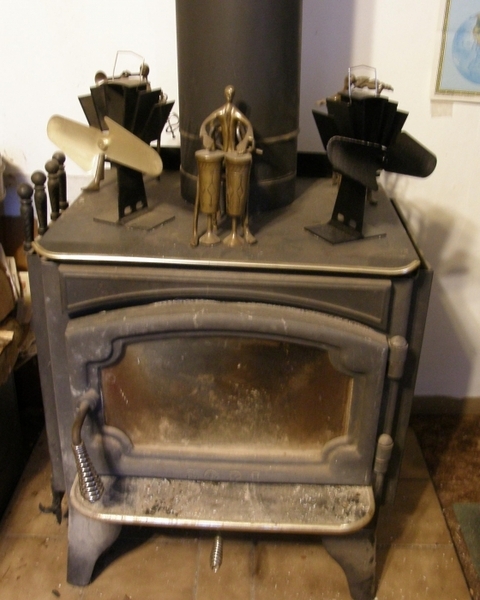 This item works well but does take a while for it to heat up enough to start working, not sure if it's my wood stove the room is large and that could be the reason. It is quiet and once it starts it is great. next time I would get the better models. This fan was a hit at my Superbowl party.The engineers and non engineers were fascinated with it! The Ecofan I ordered arrived just before the "Blizzard of 2015" (aka Juno) and when put atop my wood stove (a Jotul 602 or is it 620) moved heated air effectively throughout my room and throughout the storm. Silently. That's right -- silently. We love this fan! 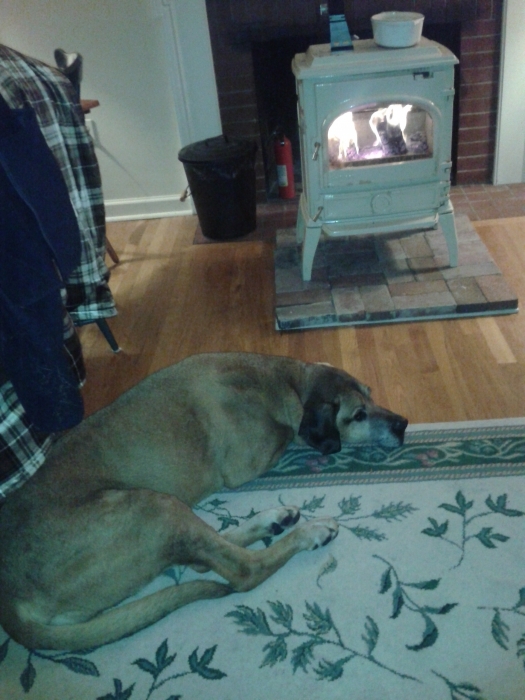 It distributes the heat from the woodstove throughout the house! And the price is very reasonable. Nice product, but very fragile. Don't drop or get anything to hit the fan as it's working. ConsFragile. Wish I had gotten the larger version. The product purchased was of high quality, the shipment was on time and prompt. That's all I ask for! works great, saves on wood! As described - well packaged and prompt courteous service! I like the Caframo Ecofan! It saves me money by not needing electricity. The best thing is I can retire at night and the fan still runs----with power fan I would have to turn it off going to bed. It is COMPLETELY silent and that is very good. I recommend the product to everyone. I bought one for myself and one for my son. The price was better than ones recommended by a friend. Had one it lasted for 4 years, it was used everyday for like 7 months out of the year.